Skerton ABC's Sean Coxon and Matty Doey. 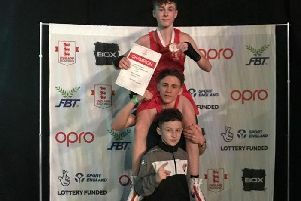 Skerton Boxing Club cemented its place as the number one club in the North West by gaining another three area champions in Manchester. Shaun Michael Varey, Lewis James Marshall and Robert Dugdale are the club’s newest champions after a successful weekend. National champion Andre Vidal Jnr was unfortunate to lose after having a very rare off day in the ring. But the three wins mean the Morecambe-based club now have an unprecedented nine North West champions. The club is also celebrating the call up to an England training camp for Varey and Vidal Jnr which could see them represent their country in Russia in September. To add to the clubs success four of the clubs boxers were in action in Maryport on Saturday evening and brought more wins home. Frank Varey, 10, was a unanimous winner with John Dugdale, also 10, completely dominating his three-round contest. Mathew Doey, 16, was next in for Skerton and he was facing the dangerous Burnley-based boxer Aqib Mushtaq from Roche ABC. Doey carried on the Skerton run however by outclassing Mushtaq to take a third unanimous points win. Senior boxed Sean Coxon, 23, made it a full house for the Morecambe-based club with a victory against home favourite Will Richardson of Maryport ABC. The boxers will be showcasing their skills at a show at the Globe Arena on Friday, March 13. Tickets can be bought from Paul Fielding on 077666 55401.